Love is eternal, Love is one time feeling, love happens ones in a life time. The question here is ‘what is love?’ Psychology depicts love as a cognitive and social phenomenon. Personally speaking, as per me, Love is a feeling for the person, a very special person in your life, when you see that person your heart beats more rapidly. You are in love – when you want to spend the whole day with that person, when you want to hear from that person, when you start dreaming about that person, when you start thinking about that person. This post has been published as a part of THE GREAT DEBATERS Topic: IS FALLING IN LOVE A ONE TIME AFFAIR ; the first edition of the Bloggers Debate; If you like this post then FAVE it here and read other entries as well. Gone are the days, when guy used to sit whole day in burning summer in front of the girls house just to see her face, wave a hand at her. Gone are the days, when a guy/girl used to spend many sleepless nights just to write the love letter to here girl/boy friend. Gone are the days, when lovers used to be non-materialistic. Gone are the days, when people died for love. Gone are the days, when Love used to be blind. In this Materialistic world, love got the eyes, love is no more blind. In this Materialistic world people break up faster than the glass and before breaking up they find another person who they think is there soul mate. So, is ‘Falling in Love is a once-a-lifetime feeling’ in this modern 21st century, no, off-course not. I am not saying that, you won’t find true love in 21st century. I am just saying that you may find true love more than once in 21st century :). Last but not least, “The beginning of love is to let those we love be perfectly themselves, and not to twist them to fit our own image. Otherwise we love only the reflection of ourselves we find in them – Thomas Merton”. 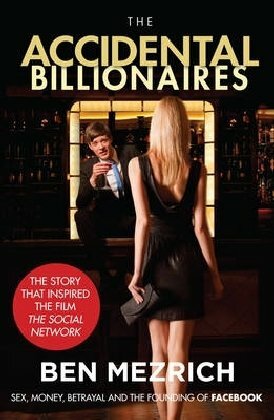 The Accidental Billionaires is the story of founding of Facebook and revolves around the founders Mark Zuckerberg’s and Eduardo Saverin’s friendship as Harvard undergrads and how the social networking site (Facebook) which is famous for connecting people tore the two best friends apart. The accidental billionaires is the story of the founding of Facebook written Ben Mezrich. The only thing missing in the above book is the direct contribution from Mark Zuckerberg. In the first page of the book, Ben Mezrich mentions that “The accidental billionaires is a dramatic, narrative account based on the dozens of interviews, hundreds of sources, and thousands of pages of documents, including from several court proceedings”. If you haven’t seen the movie The Social Network yet (which is highly unlikely), you can read the book first and then watch the movie. If you saw the movie, then still you can read the book. The flow of movie and the book is totally different. I enjoyed book more than movie. I watched the movie first and then I read the book, there are many things which are not in movie but are in the book. This book is not fully technical or geek book, you can only see few geeky words in the book. This book is revolves around the finance and how Facebook became Harvard’s Drom Room project to one of the most successful internet company. Ben Mezrich has very cleverly described the student life in Harvard and Mark Zukerberg’s personality. The book contains some very interesting moments, moments like when Mark hacks into the Harvard database while simultaneously blog’s about it and creates Facemash in single night which instantly becomes hit and withing 3 hours it crashes the university’s server. Plot : Eduardo Saverin and Mark Zuckerberg – an awkward maths prodigy and a painful shy computer genius – where the archetypal social misfits of polished elite Harvard. Yet one day master-hacker Mark created a rateable database (Facemash) of female students, which was so popular it crashed the university’s server. Narrowly escaping the expulsion, the two friends refocused the site into something less controversial – ‘The Facebook’ – and watched as it spread like wildfire across campuses around the country and beyond. Suddenly everyone – from hot girls to venture capitalists – wanted to know Eduardo and Mark. Yet amidst the popularity, cash, glamor and power, what began as a simple argument spiraled into a out-and-out-war. The great irony is that Facebook succeeded by bringing people together – but it’s very success tore two best friends apart.